It has never been easier to be creative at home, and making music is no exception. Instruments are more affordable than ever—especially guitars—and there is a myriad of studio quality audio equipment accessible to regular home musicians. Perhaps most importantly, there’s a wealth of information out there on the web to help you get along with your musical ambitions. With guitar being one of the most popular instruments to play, it’s no surprise that more and more people are looking to record their playing at home. This can be for a number of reasons; sending a riff to a friend, demoing a song, recording a studio quality track. Fortunately you can accomplish all of this without having to spend a fortune on expensive equipment, and in this hub, we’re going to look at your options. For the sake of simplicity, we’re going to break our options into four main categories. 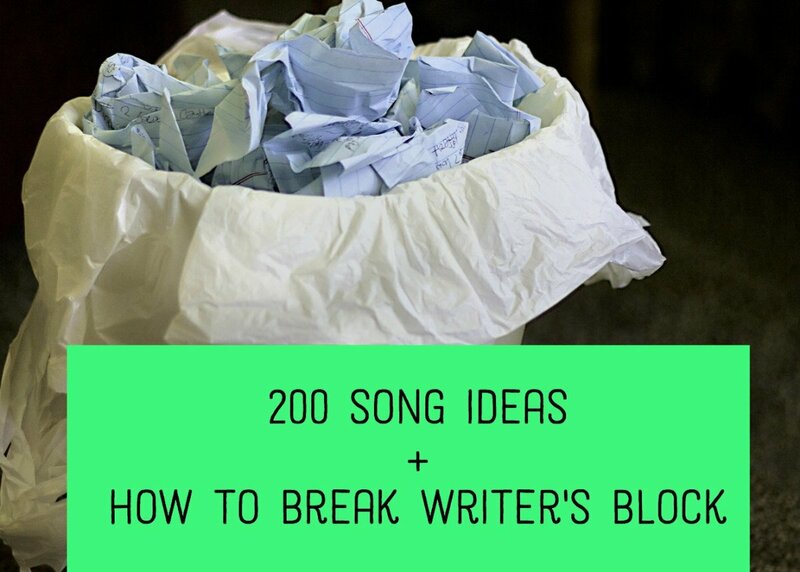 Before we get into that, however, let’s look at a few rough and ready methods that you can use for situations where you don’t need a super high fidelity audio, such as demoing a song. Sometimes you don't need the absolute best quality recording you can get. The quality of audio recording on your average smartphone has improved markedly in recent years, but no one should kid themselves into thinking that you can make a high quality recording with your phone’s built in microphone. There are other options, of course. If your guitar has an output, such as an electric or electro-acoustic guitar, there are many devices available that allow you plug your guitar directly into your phone. For guitars that don’t have an output, or if you want to record guitar through an amp, there are higher quality microphones that can be plugged into your phone. The situation for recording your guitar directly into your computer is almost identical to that of recording through your phone. Your computer may have a built in microphone—almost certainly if it’s a laptop—which will likely be of relatively poor quality. You can also plug in a higher quality external microphone, or use one of a variety of methods to record a guitar with an output directly into the computer (more on that later). The most significant difference between recording with your phone and recording with your computer is that, for the time being at least, the capabilities of external devices that can be added to a full computer is far greater than what can be used with a phone. Not many people still carry dictaphones, but digital recording devices can be found relatively inexpensively, and if you’re the kind of musician for whom inspiration can come at any time, it might be good to have one to hand for those moments when lightning strikes. There are many ways of getting guitar audio into your computer, and the one you choose can make a big difference. We’re going to start with getting the audio into your computer, because the way you decide to do this will affect later choices, such as what microphones you can use. As covered above, you can simply use built in computer microphones or inexpensive USB mics, however the audio quality of what you’re recording will be far from perfect. 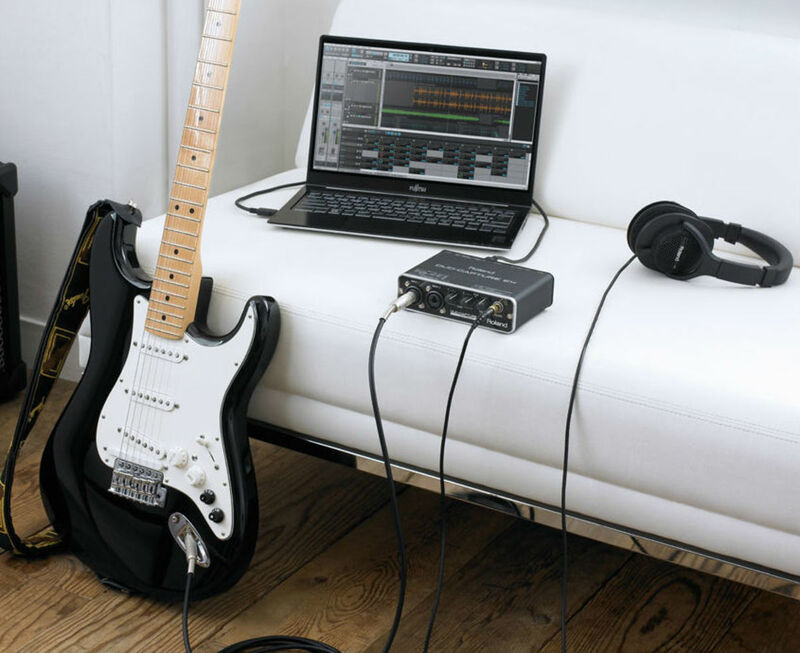 If you plan to use your guitar signal dry—perhaps adding effects processing to it later—you can pretty much run a cable from your guitar (if it has an output of course) straight into your computer. You will likely need an adaptor of some sort, as your computer in all likelihood won’t have a 1/4” jack with which you can plug your guitar into. You can, however, get 1/4” to 3/8” adaptors, USB guitar input adaptors, and external audio interfaces. Your choices here will impact your choices later. For example, if you decide you want to use a microphone that requires phantom power, you will need an interface that can supply that power. Similarly, if you want to record using multiple inputs (as you might with an acoustic guitar or mic’d amp cabinet), you’ll need the ability to capture multiple audio sources. There are many solutions to this particular problem. For example, the Focusrite Scarlett Solo is only $100, and provides you with two high fidelity audio inputs through your USB ports, making it portable. This is my personal choice as I use mine regularly and can speak to its quality and durability. There are many other alternatives at both the cheaper and more expensive ends of the scale, however. As with all things, you need to find a balance between the quality you’d like and the price you’re willing to pay. Another option when recording guitar into your computer is buy a guitar with a built-in USB output. Bear in mind that these guitars tend to be a bit “gimmicky”, and you’re not likely to find many high quality production guitars with this feature. But again, if you’re just looking for something you can demo with, this could be a good solution. Already have a complete rig? You may as well use it. The process of recording an amped electric guitar is, technically speaking, the simplest way to capture guitar sound. For one thing, if you own a full rig (guitar, amp, pedals, etc), there’s a good chance you know what tone you’d and how to get that tone from your rig. And, if that’s the case, all that’s left for you to do is get that sweet sound into your computer. The obvious solution would be to run a direct line from your amp’s output jack straight into your computer, but we’re not going to do that. For technical reasons involving electrical currents and "paths to ground" that I won’t try to explain here, running an amp directly into another piece of equipment (such as a PA system) never sounds good. If you have the means to do this, it’s worth trying it and comparing the result to the live sound—or even a set of headphones—just so you can see for yourself how drastic the difference can be. That leaves us with only one real option. Mic’ing. 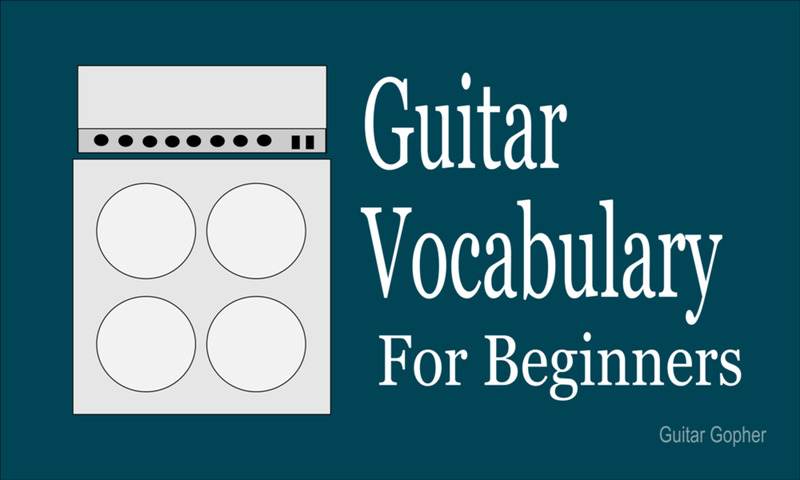 If you’ve ever seen a guitarist perform live in a relatively large venue, you might have noticed a microphone (or microphones) set up pointing at an amp on the stage. This is because, in situations where the venue is large enough that the amp alone is not loud enough, it is quite simply the best way of getting the audio from the amp to the rest of the room, and it’s the same with recording. The question then becomes, what hardware do you use? 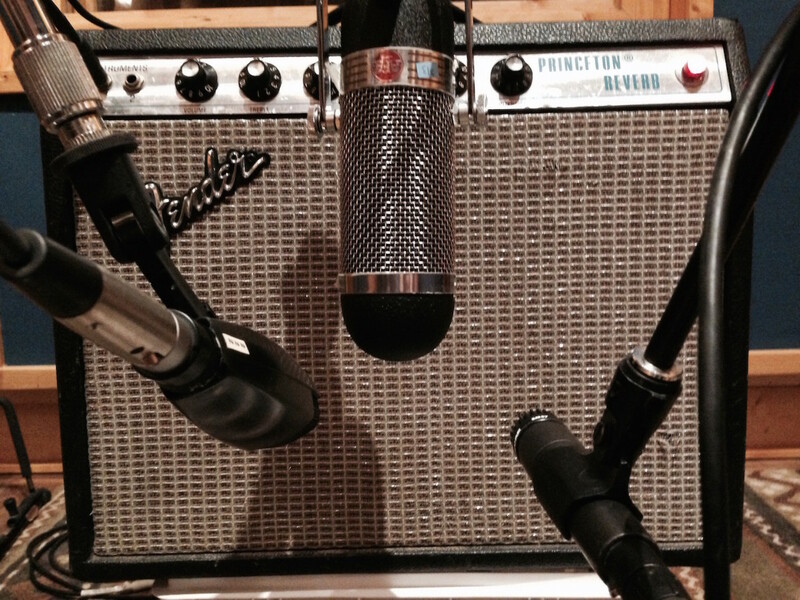 Obviously you can stick any old microphone (see above about using phone/laptop microphones) in front of your amp if the quality of the recording is not important. If you’re looking for higher quality however, obviously you want to go for a better microphone, but then the question becomes how much better. The industry standard for mic’ing amps is the Shure SM57, which costs around $100. There are cheaper options, however with the Pyle-Pro PDMIC78 being a particularly good inexpensive alternative for a tenth of the cost. You will also need a way of placing your microphone, preferably one that is easily adjustable. The difference in sound that even the smallest of adjustments in microphone placement can make is dramatic, and while you could get away with a stack of books it’s probably best to invest in a stand given that they can be little as $20. As well as the type of microphone you want to use, you need to consider how many mics you want to use, and what combination of mics if you do use more than one. In a proper recording setting, such as an acoustically treated studio, it’s common for “room mics” to employed, though if you’re recording in your bedroom it may be better to stay away from room mics as they could muddy the tone or pick up unwanted noises. Using multiple mics on the cab itself can give you a more dynamic sound, but it's also important not to get too bogged down in mic placement. If you spend an entire day fiddling with a stack of mics searching for the perfect sound and don't record anything, you might have wasted your day. Don't have a rig? We can work with that. 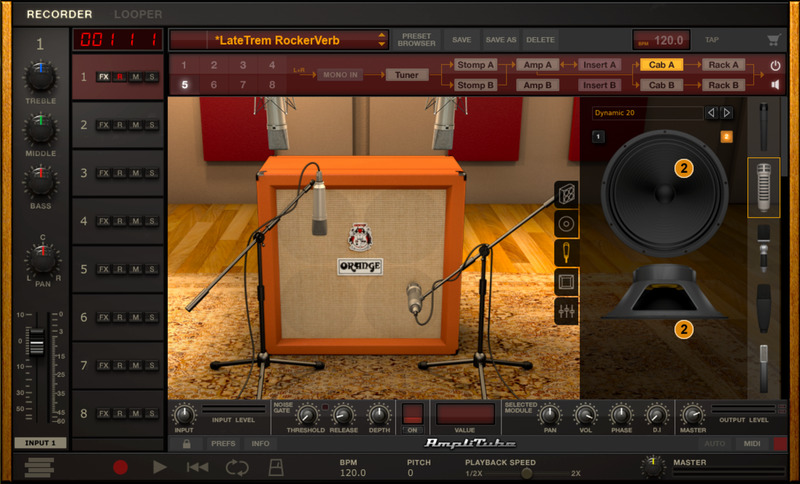 IK Multimedia's Amplitube software can simulate everything from the amp, pedals and racks, right down to the microphones being used and the room in which it's been "recorded". When referring to recording guitar “dry”, we’re talking about taking the signal from an electric or electro-acoustic guitar and recording it directly into your computer. There are a number of reasons you would want to do this, not least of which because it’s the cheapest method of recording guitar, and the one that requires the least physical space in terms of equipment. It also leaves you with the most work to do after your initial recording, so your needs and circumstances will be a driving factor in choosing to record guitar this way. 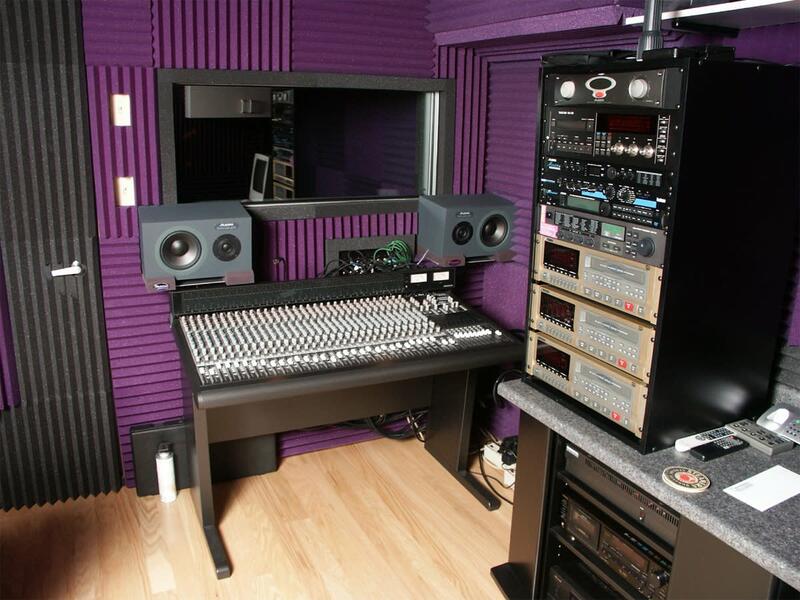 In the case of recording an electro-acoustic, the post production may be as little as mixing the dry signal with a microphone input to get a better sound, but with electric guitars the dry signal will likely need a lot work. In the realm of software-based guitar effects, there are many options in both the free and paid categories. Two of the bigger players in this arena are IK Multimedia’s Amplitube, and Komplete’s Guitar Rig. These two are perfect for this hub because not only are they at the top of the game when it comes to software-based guitar amp simulation, they also offer both paid and free versions (obviously you get more if you pay). 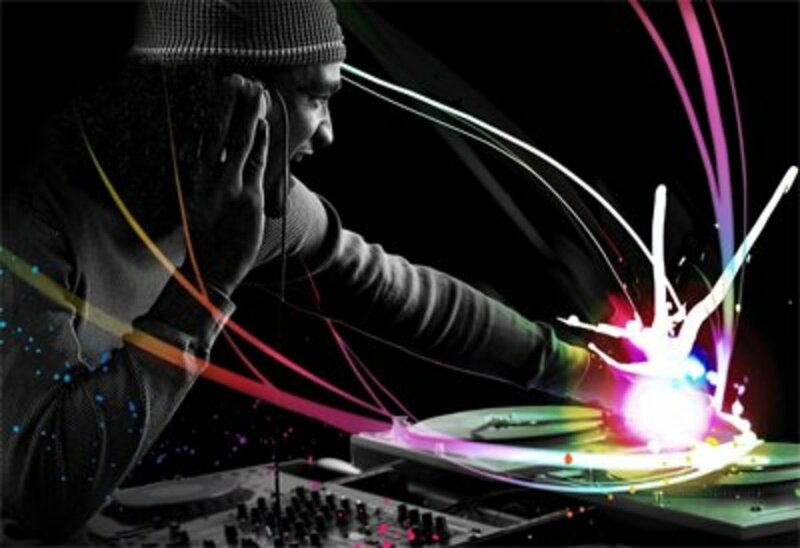 These applications, and others like them, replicate the effect of various guitar amplifiers, as well as pedals, cabinets, and even the rooms and microphones used to record. There are many debates about the actual sound of a simulated amp versus the real thing, and such debates may never go away, but simulated amps have been consistently improving over recent years. It’s a judgement call you’ll have to make, but simulated amps are without question good enough for demoing purposes, and an increasing number of musicians are happy to use them rather than buy big expensive gear. It's tricky to do at home, but you can do it! If you don't own an acoustic guitar, or don't have the means to record one, there are "acoustic simulation" pedals that can be purchased relatively inexpensively. The sound isn't a perfect emulation, but it might be good enough. These pedals are also offered in many amp simulation applications such as those mentioned above. Acoustic instruments in general are among the hardest to record well. 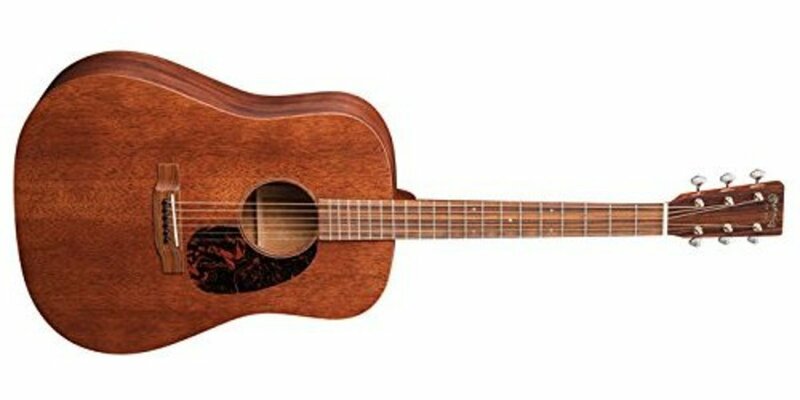 Acoustic guitars in particular can be a little misleading because they can come in electro-acoustic flavour, but unless you’re willing to spend upwards of $1,000 on your instrument the audio coming out of your guitar’s output jack will likely need some work before it’s ready for a final mix. And even with those high end guitars, many professional audio technicians still prefer to mic them up for the absolute best sound—perhaps using a mix of room mics and the guitar output itself. Mic’ing an acoustic guitar can be something of an exercise in trial and error, especially if you’re working with a budget and only have one microphone to hand. A common method is to have a directional microphone set at about eight inches away and pointing at the twelfth fret of the guitar. Re-aiming the microphone towards bridge will produce a sound with more bass, while moving toward the nut will produce more treble. 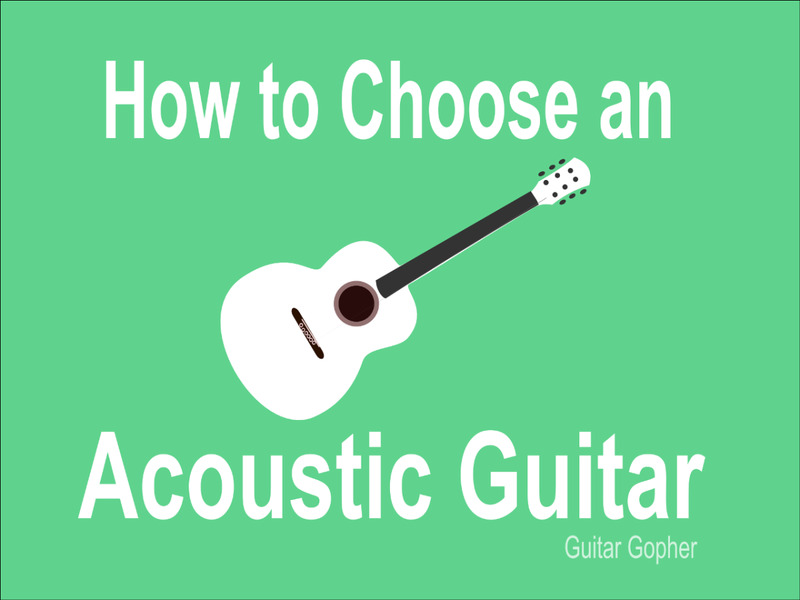 Obviously you can increase the richness of your sound by adding mics, either by pointing them at a different part of the guitar, placing them over the shoulder, or just adding general room mics if your room has good acoustic properties. 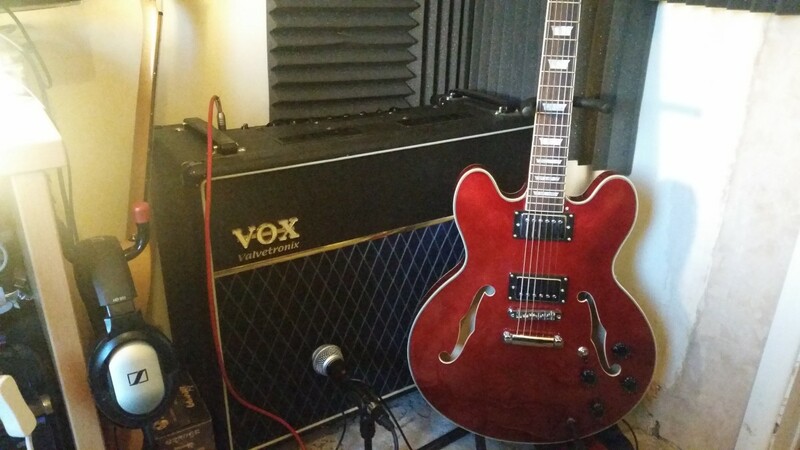 Recording guitar at home can be done very well on a small budget, and it can be done great on a moderate one. The days of needing to book studio time or spend a fortune on expensive audio equipment are long gone, so let those creative juices flow! 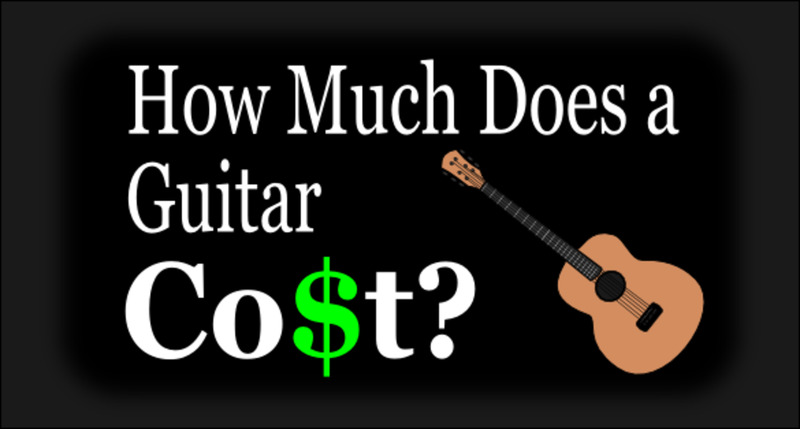 How Much Does a Guitar Cost for a Beginner?